Private Pool, Huge screened-in porch and lavish decorations. Kingston Cottage Private Pool for your Vacation Enjoyment Perfect screened-in porch to hang out on or eat a meal. Comfy porch swing of your vacation dreams. Alternate of Kitchen Come home after a day on the beach and curl up on the sofa or eat a hearty meal at the dining table. Open concept living, dining, and kitchen with flat screen t.v. Dining area leads out to huge screened-in porch The perfect kitchen for making a family meal. King master bedroom with gorgeous decor. Alternate view of first floor master king bedroom Upstairs King Masster with pull out sofa for extra guests. Upstairs King Master has access to a shared balcony and private bathroom. Shared balcony space with two rooms full over full bunks are perfect for fitting 8 kids. Alternate view of bunk room private bathroom connected with shower/tub combo Alternate view of shared blacony. Lots of light comes into this bedroom. Alternate Aerial. Second Floor contains a laundry room for your convenience. Welcome to Kingston Cottage Aerial of Kingston Cottage Relax on this beautiful screened-in porch with plenty of seating. Imagine relaxing here by the pool with a good book. Kingston Cottage is grand vacation home. 30A Escapes presents... "204 E. Kingston", a Rosemary Beach Gem! Nestled in the Northeastern nook of Rosemary Beach sits a home riddled with architectural idiosyncrasy and charismatic characteristics, a perfect design for a total vacation package you and your family will never forget. Rosemary Beach is a pristine white sand beach community located along Scenic Highway 30A in the Southeastern portion of Walton county Florida. From Summer concerts, wedding venues, eccentric shops, and an array of delectable dining options, Rosemary beach has more to offer than most beach communities along the gulf coast. While staying at 204 E Kingston you won't have to worry with parking as the home offers three spaces in the driveway near the back of the home, a nice touch if you have ever had to deal with the street parking there in Rosemary. Upon pulling into the drive you'll notice the stone wall circling the private pool which has the capability of being heated during the cooler months. You'll find yourself lounging under the patio umbrella with a cocktail watching the kids play, before you can even unpack. After crossing through the pool area the gas grill is located just a few steps off the huge screened in porch area. A gentle gliding swing, several chairs and a nice large wooden table, make the perfect atmosphere and setting for a nice summer lunch with the family without the hassle of any bugs or unwanted pests. Stepping inside through the glass doors you'll find yourself in the dining area. The dining table sits just inside the doors with enough seating for 8 to circle around comfortably. 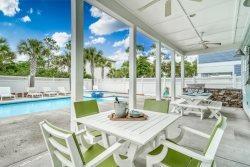 Flowing in an open concept, the living area is just beyond the table equipped with a large wrap around sectional sofa, a sizable flat screen television, and beach inspired knickknacks and decor. A half bath is located around the corner with one of the most unique sinks in Rosemary, crafted specifically for this home. The kitchen is just off to the right and is well stocked containing stainless steel appliances and everything you'll need for your time in the home. The massive island offers an excellent place for prepping seafood dinners or just gathering to socialize after a long hot day. The first floor Master has a king sized bed and attached bathroom with shower. The soft color palate and fine furnishings make this bedroom one to be coveted if not only for its wonderful view over the pool area. Heading up the stairs you'll find yourself split between two directions. Off to the right is the washer and dryer room, well furnished with Samsun front loading washer & dryer that can handle all of your clothes. Further down is the bunk room which even the grown ups will find appealing. Two twin over full bunks built together with steps and cabinets line one side of the room just opposite of the flat screen tv. The bunk room has an en suite bathroom with tub as well as direct access to the large balcony shared by the master suite. Just outside the room the master suite is located and provides a roomy sitting area with coffee table, a beautiful king size bed and an en suite bathroom with shower. The couch here is also a pull out for extra sleeping space. The door on the opposite wall leads to the large balcony which has comfortable wooden chairs and a couch for lazing under the stars before bed. The final bedroom is at the opposite end of the hallway and contains a king size bed and bathroom with enclosed shower. While staying in Rosemary you will also have access to all four community pools, the bikes that are provided complimentary at the home, and any beach access that you want to use. Come see what all 204 E Kingston road and Rosemary beach has to offer you and your family for your next vacation!